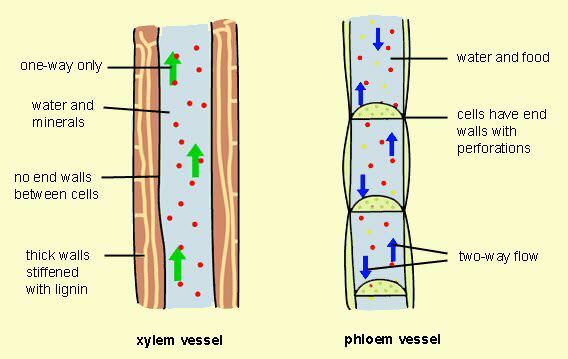 Phloem and xylem are complex tissues that perform transportation of food and water in a plant. They are the vascular tissues of the plant and together form vascular bundles. They work together as a unit to bring about effective transportation of food, nutrients, minerals and water. Transportation of food and nutrients such as sugar and amino acids from leaves to storage organs and growing parts of plant. This movement of substances is called translocation. Water and mineral transport from roots to aerial parts of the plant. Elongated, tubular shape with thin walled sieve tubes. The sieve tubes have pores at each end in the cross walls and microtubules that extend between sieve elements allowing longitudinal flow of material. Tubular shape with no cross walls which allows a continuous column of water + facilitates more rapid transport within the xylem vessels. There are two types - protoxylem (first formed xylem) + metaxylem (mature xylem) depending on pattern of lignin. Phloem is not star shaped. Xylem is star shaped. Phloem occur on outer side of the vascular bundle. 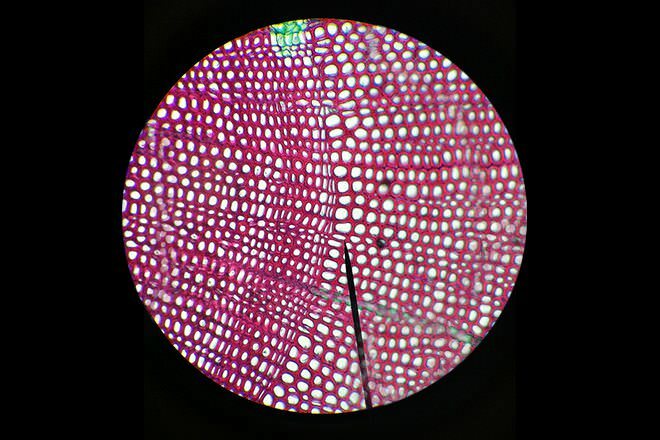 xylem occupy the center of the vascular bundle. Xylem is formed by tracheary elements like tracheids and vessels predominantly. There are a variety of other cells giving it the status of complex tissue. Primary xylem originates from the procambium during primary growth while secondary xylem has its origin in vascular cambium during secondary growth. Phloem has sieve tubes, companion cells, bast fibers as its elements. Phloem originates from meristematic cells in vascular cambium- primary phloem from apical meristem and secondary phloem from vascular cambium. Xylem sap contains water, inorganic ions and a few organic chemicals. Phloem sap contains water and sugars. Both phloem and xylem are tubular structures that facilitate easy transportation. In xylem vessels water travels by bulk flow rather than cell diffusion. In phloem, concentration of organic substance inside a phloem cell (e.g., leaf) creates a diffusion gradient by which water flows into cells and phloem sap moves from source of organic substance to sugar sinks by turgor pressure. Negative pressure facilitates movement of water and minerals in xylem while in phloem positive hydrostatic pressures are responsible for transportation. Hence phloem loading and unloading brings about translocation. Xylem transports water and soluble mineral nutrients from roots to various parts of the plant. It is responsible for replacing water lost through transpiration and photosynthesis. 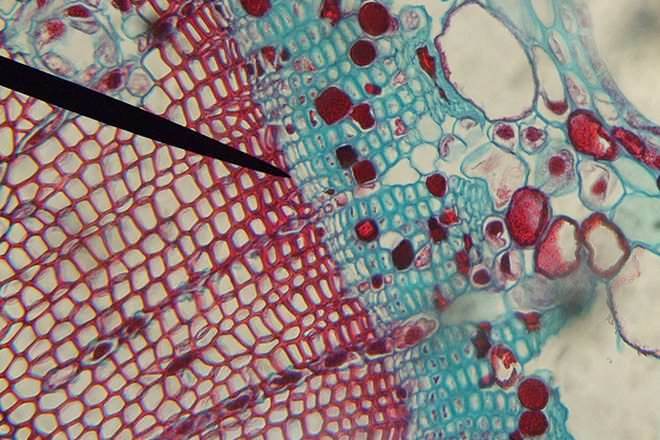 Phloem translocates sugars made by photosynthetic areas of plants to storage organs like roots, tubers or bulbs. This video explains the biological makeup of xylem and phloem and their role in plant transport. A plant can be killed by stripping away the bark in a circle around the trunk or stem. This destroys the phloem, which is present towards the outside of xylem. This is calle girdling, but such a process has no effect on xylem. This method is used to produce oversized fruits and vegetables. 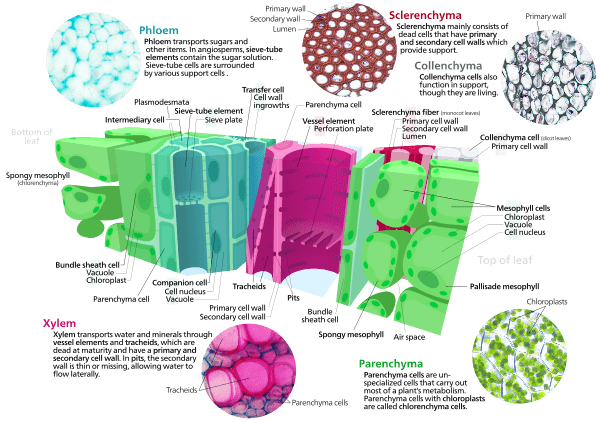 This picture presents the various types of plant cells, including xylem, phloem, sclerenchyma and collenchyma. i realy tnx nd appreciate the uderstanding of phloem and xylem. I ABSOLUTELY ADORE XYLEM TUBES. THEY ARE MOST PROPER.